Whether you are an experienced painter or someone just starting out, Dewberry U has something for you. This great new program is explained in detail in the short five minute video clip on our website. Click HERE to watch it now! We highly recommend you watch the video to get a better idea of what Dewberry U can do for you. Upon signing up you will receive the new Dewberry U manual, Dewberry U introduction DVD, and Dewberry U Pin. Click on the booklets to see Skill Builders that are now available! Get started TODAY! Find a Faculty Member in your area! Click below! Dewberry Crafts launched the Skill BuilderTM program at the 2012 convention with Donna, held in Orlando. Below is a brief overview of the program. ·Joining Dewberry U will help you create a path for your education with OneStroke® Painting and provide a central source for all of your activities within the Dewberry Organization. ·Join “Dewberry U” at www.dewberrycrafts.com or by calling our office at 352-394-7344. ·Dewberry U Membership fee $49.95 and includes your Dewberry U Notebook and Dewberry U Membership Pin. What is a Skill BuilderTM? ·A Skill BuilderTM is a NEW lesson format for Dewberry U. ·It is designed to make reasonable size classes for reasonable costs. 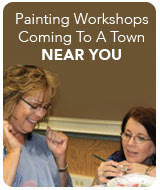 ·Skill BuildersTM are building blocks to achieve your desired painting skills and instructor goals. ·Each Skill builder is approximately 50-60 pages long and focuses on a particular set of skills/technique. 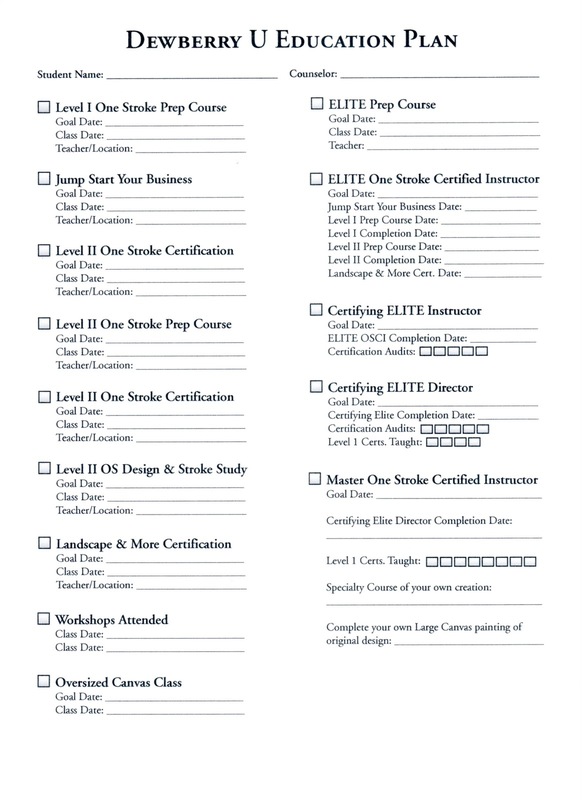 ·Purchase Skill BuilderTM from a Qualified Faculty Member* or through Dewberry Crafts at http://www.onestroke.com/ or call our office at 352-394-7344. ·Complete either as a “home study” course or in a class setting (class fee will be charged by Faculty Member). Your order consists of the SB booklet you ordered. Skill BuilderTM you successfully complete. 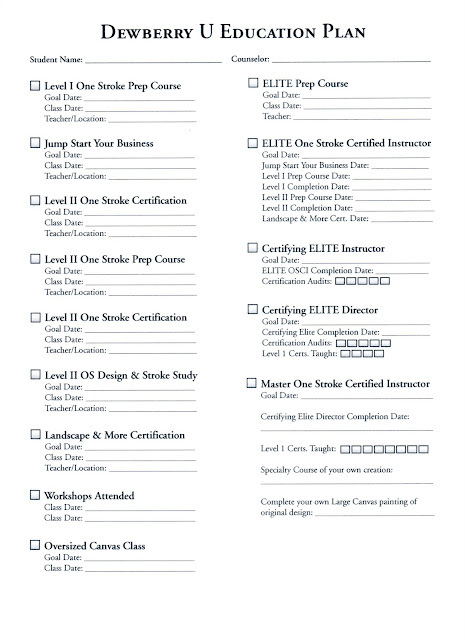 ·Skill BuilderTM Achievement Pins: Pins are available for $5.95 once Skill BuilderTM Level is completed, passed and signed off by a Faculty Member. ·A Dewberry U Faculty member is qualified* to grade and evaluate Skill BuildersTM as well as guide students along an education path that best fits their needs. ·A Dewberry U Faculty Member may only grade and evaluate the Skill BuildersTM they have successfully completed. · Once you’ve become a Faculty Member, a Faculty Member packet will be mailed to you for your notebook. If your email isn’t listed please email donnaontheroad@hotmail.comso that it can be added. In the SUBJECT line please put ADD EMAIL to FM listing. Right click on the education plan, save it and print it off today!